"City Edge" is an apartment and townhouse complex located in the inner north Canberra suburb of O'Connor, adjacent to the shops, cafes and restaurants. The complex is bounded by Bluebell, Macpherson and Moorhouse Streets. It was built on a site which previously had several blocks of flats of public housing. The ACT Government made an arrangement with a non-profit housing cooperative and a developer to redevelop the site. Three blocks of apartments were build, along with four of town houses. Some apartments were reserved for public tenants, but most are privately owned. One property is fitted out as a smart apartment, as a high-tech project. There are also several ground floor apartments specially fitted out for the disabled. Sustainability considerations were important to the project. The joint venture company contributed to the construction of a landscaped wetland on the existing Sullivans Creek stormwater channel adjacent to the site and employed solar-powered street lighting, heat pump heating and cooling and solar boosted hot water systems in the development. City Edge is an excellent example of a private/public company partnership, delivering seamlessly integrated public, private and community owned dwellings of various types, on a previously degraded site. It is a strong testament to the willingness of CIC to work with government in addressing the triple bottom line of social, economic and environmental responsibility. 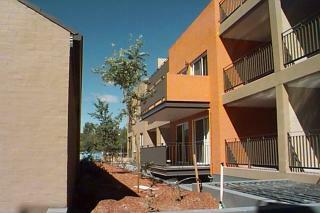 The development has won HIA Housing Award in 2003 for Special Accommodation of the Year. The City Edge complex has its own park, with mature trees which were retained when the site was redeveloped. There are solar powered street lights on the private roads in the complex. A computer controlled central solar boosted hot water system provides hot water to some of the apartments. There is fibre optic cabling for data and pay TV to the complex. A "duck pond" was built on the parkland adjacent to the complex for water quality control. 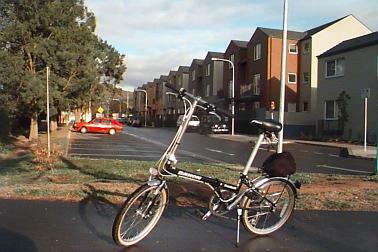 The complex is next to the bicycle path to the Australian National University, National Museum of Australia and city center (Civic). From: David Street Wetlands‎, Natural Resource Management Team, Australian Government departments of Agriculture, Fisheries and Forestry and the Environment, Water, Heritage and the Arts, 2008. Block 3 Section 86 O'CONNOR, with 37 apartments on the corner of Macpherson and Moorhouse Streets, on the north west corner of the complex. Block 4 Section 86 O'CONNOR, with 62 apartments on Bluebell Street at the south of the complex and inside on Bluebell Close adjacent to the park. Block 5 Section 86 O'CONNOR, with 8 Townhouses on Bluebell Street on the eastern side of the complex, overlooking the duck pond and playing fields. Block 6 Section 86 O'CONNOR, with 17 townhouses, on the corner of Moorhouse and Bluebell Streets, on the North East corner of the complex. Photos and a floor plan of the one of smaller town houses, and apartments, are available. After the complex was built, part of Moorhouse Street was renamed to Bluebell Street. So some older references to properties in Moorhouse Street may be to Bluebell Street. Also roads inside the complex were sign-posted "Bluebell Close", although later changed to "Bluebell Street". After City Edge was built, another 26 apartments were constructed at the corner of Bluebell and Macpherson Streets. While not part of City Edge, these are well worth a look. These are on Block 8 Section 86 O'CONNOR and some photos are available. Changes to City Edge must meet the ACT Planning and Land Authority Design Guidelines. Current Development Applications for City Edge are listed under "O'Connor", on the ACT Government web site. Copyright © Tom Worthington 3 July 2006.